张成, 祖露, 李清清, 成永旭, 吴旭干. 2019. ZHANG Cheng, ZU Lu, LI Qing-Qing, CHENG Yong-Xu, WU Xu-Gan. 2019. Oceanologia et Limnologia Sinica, 50(2): 388-397. ZHANG Cheng, ZU Lu, LI Qing-Qing, CHENG Yong-Xu, WU Xu-Gan. 2019. THE POPULATION INHERITANCE OF SIX MITTEN CRAB POPULATIONS (ERIOCHEIR SENSU STRICTO) IN COASTAL CHINA BASED ON PHOSPHOLIPID FATTY ACIDS BIOMARKERS[J]. Oceanologia et Limnologia Sinica, 50(2): 388-397. Abstract: The fatty acid composition of aquatic animal muscles can be used to evaluate their population inheritance. 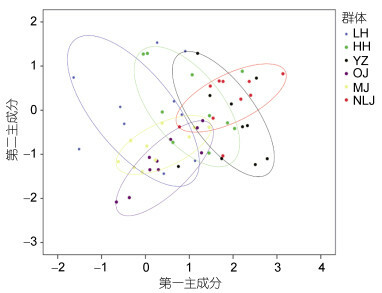 In this study, the fatty acid compositions of the six Eriocheir sensu stricto population muscles were measured and compared in phospholipid fatty acids biomarkers, and the six populations were from Liaohe, Huanghe, Changjiang (Yangtze), Oujiang, Minjiang, and Nanliujiang River basins. The genetic diversity and phylogenetic relationship were analyzed among the six Eriocheir s. s. populations. The results show as follows:(1) All the six Eriocheir s. s. populations contained 26 types of fatty acids among which the total volume of seven main fatty acids C20:5n3, C18:1n9, C22:6n3, C16:0, C20:4n6, C18:2n6, and C18:0 was over 74%; (2) There were eight fatty acid indices with high contribution to the discrimination of the six Eriocheir s. s. populations, including C17:0, C18:0, C20:0, C22:1n9, C18:3n3, C18:3n6, C20:2n6, and C22:5n3. 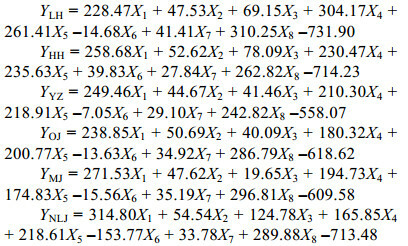 Relevant discrimination equations were established for each Eriocheir s. s. population, the synthetic discriminant accuracy was 98.33%; (3) The results of cluster analysis show that the Euclidean distance between OJ and MJ populations were the closest, and the distance between HH and YZ populations were relatively larger than those of OJ and MJ populations, and the Euclidean distance of NLJ population was the farthest compared with the other five populations; (4) Among the six Eriocheir s. s. populations, the variable coefficients of fatty acid content ranged 2.99%-30.00%, and the genetic diversity indexes varied from 3.2732 to 3.3204. Overall, the genetic diversity indices of the six populations were quite high based on phospholipid fatty acids biomarkers. Fatty acids were effective to identify the six Eriocheir s. s. populations. The phylogenetic relationship of the other five populations were the farthest from NLJ population. The results of this study provide basic information for the evaluation, development and utilization of germplasm resources of Eriocheir s. s.